Note from Kaveh: Periodically I invite thought leaders and practitioners who have done important work in the field of leadership to contribute as guest writers. Such is the case for this posting. Paul Black is a former actor and an accomplished leadership practitioner with a particular expertise in the area of communication effectiveness and executive presence. We have worked together on several coaching assignments where one of the presenting issues was communication effectiveness and executive presence. Paul is one of the leaders in the leadership and coaching practice of my company, Philosophy IB. 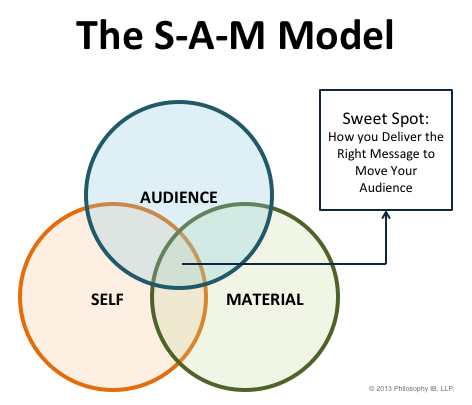 At the center of the three interlocking circles is your ‘Sweet Spot’, where YOU (Self) deliver the RIGHT MESSAGES (Material) that move your AUDIENCE in the desired direction. This model applies to all and any interactions, from one-to-one conversations, to small group meetings, to large group presentations, to broadcast communications. The principles apply in each scenario in different proportions dependent on the specifics of the interaction. With each of these elements, it’s important to recognize that you will have some natural tendencies that you will want to lean on, and some that you will need to work around. Since we have been communicating since birth, we’ve learned a lot of habits, not all of which are helping us. By raising our awareness of them, we can begin to be mindful about what we choose to use and what we need to develop. In addition, we can choose a sub-set of specific elements to lean into or emphasize for one type of interaction, and a different sub-set for a different scenario. In other words, what works well with a peer at a power breakfast, might not work so well with the C-suite in the afternoon. As with all personal development, mindfulness is foundational. Let’s take a closer look at each other three elements of SAM to understand them better. What does my audience WANT? What does my audience NEED? Make sure you know the difference. Here’s a simple example: if my friend takes me out to lunch, and suggests “You need a healthy salad,” I’m much more likely to agree if I can get some of what I want (bacon bits in the dressing), and I’m much more likely to think it was a great experience. Balance out both Wants and Needs in your interaction, and you’ll set yourself up for success. Speakers fail when they confuse their own objectives with the Wants and Needs of the audience – don’t make this mistake. End: tell them what you just told them. Imaging: pick a role model you admire and think about how he or she would do it….what can you learn from that person? Steve was a successful SVP at an insurance services company, and unofficially, the successor to the CEO who was grooming him. The CEO, however, was fully aware that Steve had some career-limiting blind spots. In working directly with Steve, we assessed that he was technically brilliant, knew the industry and business intimately, and could lead his people from a place of intellectual superiority. One of Steve’s challenges was interacting with the boardroom, who chaffed under what they preserved as an air of arrogance and “know-it-all-ness.” The CEO was not blind to this and knew that his succession plan hinged, in part, on a shift in Steve’s ability to influence the board, without whose good grace he could never succeed. We identified an opportunity where Steve would be making an important presentation to the board to request funding for a series of initiatives that under-pinned a large part of his operating plan for the following 18 months. This would be no push-over presentation. The board would scrutinize his plans and could easily hold back funding for a wide variety of reasons, including, to put it bluntly, “not liking his attitude.” To increase the stakes, this kind of presentation only happened at most once a quarter, and with such a tight agenda, he might not get a second bite at this cherry for 6 – 9 months. Without a clear approval of funding for his initiatives, his operating plan for the next fiscal year would be in jeopardy, along with the CEO’s succession plan. We met with Steve several days before the board was due to convene at a private ranch in Arizona. We set up a video camera with playback options so Steve could self-assess and we could work with him to make any necessary modifications. However, it quickly became apparent that the technology was redundant, for reasons I’ll explain. Steve launched into his presentation, which was thick with the technical justification of why his requested funding was imperative. We had agreed beforehand that he would have about 15 minutes to present and would anticipate about 15 minutes for questions, but by the time the quarter-hour mark was up he was only about 1/3 of the way through his dense slide deck. We stopped Steve and began to lean into the SAM model. What did his Audience Want? What were their Needs? Were his messages crisp and clear? Were his material / slides appropriate? What was his mental attitude (coercive, or generous, or…what?). Steve was a quick learner and quickly understood that he had to make some serious shifts. After an hour of coaching and discussion he had a clear plan of what needed to change and how. Despite his very busy SVP schedule, he committed to carving out the time before the Arizona presentation to re-visit the key areas we identified together….the ball was in his court. When the presentation came, Steve, with a clear view of what his Audience Wanted and Needed, along with a new, leaner set of messages and a significantly altered mindset, stood up to make his case to the board. We later learned that within two minutes of his starting to speak one board member discretely turned to another and whispered, “Something’s changed here…has he been coached?” Steve’s presentation was a roaring success: the board funded all his initiatives for the following year. His operating plan was now well positioned for execution, and the CEO’s succession plan appeared to be falling into place, which was good news for both the CEO and Steve.